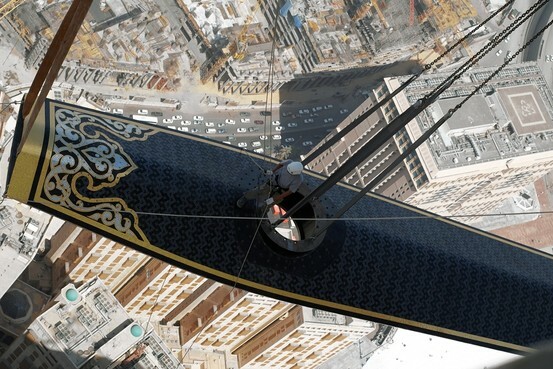 A 7.5-ton hour hand is installed on a Perrot clock on a skyscraper in Mecca in 2010. CALW, Germany—Perrot GmbH & Co. has been making bell-tower clocks for 150 years, but the order from Saudi Arabia was on a new scale: a 140-foot-diameter clock, installed at a height of more than 1,300 feet, in the heart of the holy city of Mecca. The family-owned company from the Black Forest is building its exports beyond its traditional European base, expanding ties with fast-growing developing countries. The geographical shift is happening at many of Germany’s 270,000 manufacturing companies, which are gaining customers in the emerging economies of Asia and Latin America and reducing their dependence on the shrinking euro-zone economy. German firms are increasing the amount of business they conduct with emerging economies at the expense of European countries. Dow Jones’s Nina Koeppen explains why companies like car-maker Volkswagen have led the push into new markets. Photo: Perrot GmbH & Co.
Perrot’s oversize dial for Mecca Royal Clock Tower Hotel—the world’s second-tallest skyscraper, after the Burj Khalifa in Dubai—is visible from more than five miles away. But the project “has made us visible all across the Arab world and beyond,” said Johannes Perrot, who runs Perrot together with his two brothers. For German industry, “the trend of unlocking new markets will continue, given rapid economic growth and solid capital investment in emerging markets,” said Ilja Nothnagel, a foreign-trade adviser at the German Chambers of Commerce and Industry in Berlin. Blue-chip companies such as car maker Volkswagen AG VOW3.XE +0.29% have led the hunt for markets beyond Europe. But a growing number of small and midsize German companies, especially those operating in niche markets, are decoupling from Europe too. “If we relied on the euro zone only, the company would be on a less-stable footing,” said Stefan Klebert, chief executive of Schuler AG, SCUN.XE +0.54% a maker of specialist presses for coins, automotive parts and other metal products. Perrot GmbH & Co. KG Perrot’s oversize clock for the Mecca Royal Clock Tower Hotel in Saudi Arabia has a 7.5-ton hand, installed in 2010. German companies’ reputation for quality engineering, a sought-after mix of specialized equipment and high-end goods, and years of effort to boost competitiveness are making German goods popular in fast-growing developing countries. The so-called BRIC countries—Brazil, Russia, India and China—are expected to power global economic growth next year, while the euro-zone economy is forecast to contract again in 2013. German exports to the BRIC countries have increased almost sevenfold since 1996, totaling €121.2 billion ($156.7 billion) in 2011. “We are currently observing a continental drift in global economics,” said Ralph Wiechers, the chief economist at Germany’s VDMA engineering federation, which represents about 3,100 midsize companies. “German engineering companies by now sell three times as much to the BRIC countries than to the periphery states of the euro zone—or Italy, Spain, Ireland, Portugal and Greece,” he said. Sabine Herold, a managing partner at DELO Industrial Adhesives,FUL +0.95% said her company is drawn to the growth potential of markets in China and Southeast Asia. “We supply special adhesives for electronic and microelectronic industries, and they are foremost in Asia,” she said. DELO, which is based in Windach, Germany, near Munich, employs about 300 people. German exports for this year through October rose 4.8% from a year earlier, boosted by 11% growth in exports to countries outside the European Union, according to data published Monday by Germany’s official statistics office. 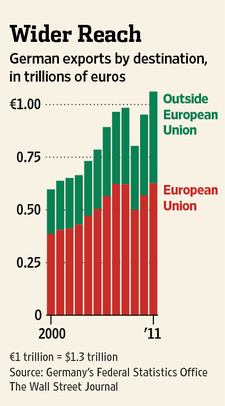 In contrast, exports to the euro zone fell 1.2%. As Europe’s biggest economy becomes less dependent on its traditional markets in the euro zone, some Germans are even beginning to question whether Europe matters as much to Germany as it used to. Some euro-skeptic commentators such as the author and former Bundesbank director Thilo Sarrazin argue that Germany’s future interests lie beyond Europe. Most German companies say European markets are still a major part of their business. France is expected to stay Germany’s biggest trading partner in the next few years. But growth, increasingly, is coming from elsewhere. China is likely to replace France as the top destination for German exports by 2030, according to a recent report on the global trade outlook by economists at HSBC HSBA.LN -0.28% . The euro zone’s share of total German exports fell to 37.6% in the first three months of this year, compared with 51.6% in 1991, according to Germany’s statistics office. 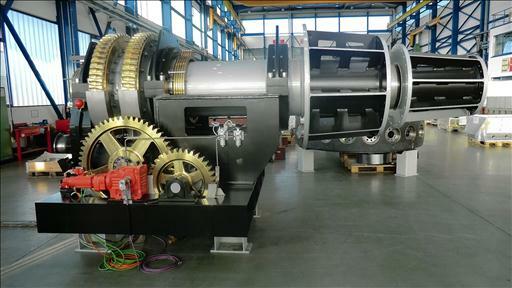 “Future growth will be mostly outside the euro zone,” said Mr. Klebert, the CEO at press maker Schuler. “Therefore, Asia—particularly China—the U.S. and Brazil are key markets for us,” he added. Schuler today generates about one-third of its sales in Asia, compared with just 5% in 2000. Schuler, whose business also supplies presses for the production of aerosol cans, is counting on the huge potential of China’s consumer market. “With a population of 1.3 billion people, there’s expanding demand in China for hair spray and deodorant—that’s where we come in,” Mr. Klebert said. Perrot also operates with much broader reach now. Over five generations the Perrot family has gone from making clocks for village churches in the Black Forest, to equipping spires in Switzerland and other European countries, to supplying far-flung global markets. Being from Calw, a stronghold of the devout Christian Pietist movement, helped Perrot win the confidence of its Muslim customers, Mr. Perrot said. “We are very organized here. Our workshop is clean and tidy and there aren’t any pinup girls on the walls. That’s what our customers respect,” he said. Perrot has recently supplied large clocks for cathedrals in St. Petersburg, Russia, and Brazil’s São Paulo state, as well as hotels, train stations and public buildings around the world. The company is aiming to break into the Chinese market next. It is already the unlikely export champion of the small town of Calw, previously known mainly for being the birthplace of Nobel-laureate novelist Hermann Hesse, who was an apprentice mechanic at Perrot. 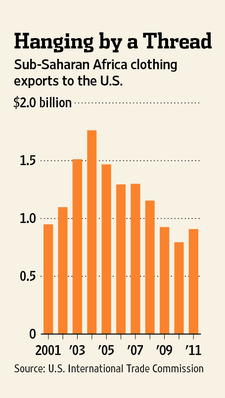 As well as developing countries, the U.S. is again becoming a source of growth as its economy recovers. German exports to the U.S. rose 21% in the first three quarters of this year compared with the same period a year earlier. Germany’s exports have been growing faster than the country’s overall economy since the early 1990s, a trend that economists expect to continue for many years. 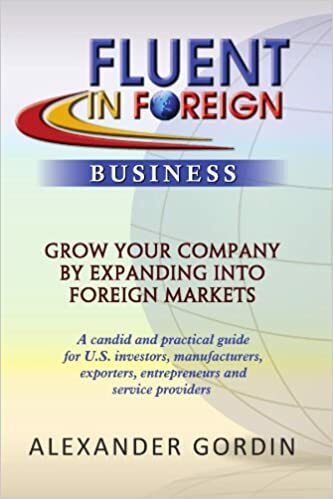 The country has become increasingly dependent on foreign customers. Exports of goods accounted for 41% of German gross domestic product in 2011, compared with 30% in 2001 and 22% in 1991, according to data from the statistics office. WestStar Food Company is an agribusiness with an appetite for new markets. That’s what led the bean producer from its home in Corpus Christi, Texas, to the “Forbidden Island” of Cuba. Well, new markets and a massive hurricane. Formed in January 2003 as a merger between Kirkeide’s Northland Bean and managing partner Patrick Wallesen, WestStar was already selling into Northern Mexico and other parts of the Caribbean when Wallesen began hearing news reports about Cuba’s openness to buying food from U.S. producers. Though the capability to ship to Cuba was put in place by President Clinton in 2000, it took a crisis to jump start trade activity. The 140-mph winds and torrential rain of Hurricane Michelle devastated the island nation’s domestic food production in 2001, and the fatal storm forced Cuba to turn to its long-standing enemy—USA—to replace some food staples for its 11 million people. Even though America had offered Cuba food as aid, Fidel Castro, the island’s then-leader with notorious nationalistic pride, reportedly huffed “No thanks—we prefer to pay.” By December 2001, agribusiness giants ADM and Cargill made news when they started shipping grain to Cuba. Few had thought of Cuba as a viable market for agricultural products shipped direct from America and its farm belt regions, but the groundwork had been laid during the last days of the Clinton Administration. In 2000, the Trade Sanctions Reform and Export Enhancement Act (TSRA) was passed, allowing exports of U.S. food & agricultural products into Cuba for the first time since the enactment of America’s trade embargo against the country in the early 1960s. The terms of trade were very simple: cash-only U.S. sales into Cuba, with payment to be made before the goods leave U.S. ports of exit. Cash upfront was certainly a stipulation that caught Wallesen’s attention. Still, he was unsure about Cuba as a realistic trading partner, especially for smaller independently owned firms. 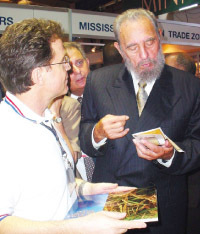 Wallesen decided to travel to Havana in 2003 and meet with officials from the country’s food import buying agency, Alimport, to gauge the market for himself. Aside from his knowledge that beans are a “must-have” item in any Cuban’s diet, it was developments closer to home that drove Wallesen to book his flight to Havana. That year, Alimport’s then-CEO Pedro Alvarez signed a memo of understanding with the Port of Corpus Christi. Afterward, U.S. dry bean sales into Cuba tallied at nearly $1.2 million for 2003—all shipped right from Texas’ Port of Corpus Christi. Putting aside that trade development, Wallesen couldn’t ignore overall U.S. food and agricultural exports to Cuba during that period. While such exports from the U.S. to Havana totaled just $4.3 million in 2001, the figure would skyrocket to $138.6 million the very next year. By 2003, Wallesen had seen Havana’s consumer market for himself and negotiated deals with Alimport after learning that Cuba was “open for business” after all. “The Cubans are opportunistic buyers,” Wallesen says. “They buy when the time is right. They buy from the U.S. between November and February.” He notes that as much as 25 percent of dry beans consumed in Cuba are from America, with the remainder originating from China, Canada and elsewhere. Wallesen says WestStar Foods sometimes exports its own supply of beans to the island nation, and at other times sources beans from places such as North Dakota. Interestingly, the firm had to learn which beans were viable in Cuba. Even though a visit to any Cuban restaurant in Miami, for example, will likely result in a serving of black beans richly heaped over a plate of steaming white rice, Wallesen learned that, for economic reasons, Alimport was instead ordering tons of pinto beans. The reason was simple. “They’re cheaper,” Wallesen says. With the rest of Washington’s trade embargo against Cuba still in effect, Alimport was forced to remain sensitive to costs—a key factor in canned U.S. beans being entirely absent from any Havana supermarket. “I doubt you will find any canned beans in Cuban supermarkets, since they’re so much more expensive,” says Wallesen. He and other stateside food producers had to be educated not only in the goods that actually sell in Cuba, but in navigating the U.S. bureaucracy still governing the trade embargo against Cuba—and its exceptions. For example, simply paying a visit to Cuba is not a matter of booking a flight with just a few mouse clicks through a commercial travel website, like going to the Bahamas or Cancún. Those who must legally visit Cuba to negotiate trade deals are required to apply for a license from the U.S. Treasury Department’s Office of Foreign Assets Control (OFAC) division in Washington, D.C. Such visitors must also get a visa from the Cuban Interests Section to visit that country. (The D.C.-based agency is given that name because there are no diplomatic relations between the two countries, but it still functions like an official embassy.) Having an appointment set up with Alimport’s headquarters in Havana may ease the process for U.S. executives obtaining these travel documents for their trips to Cuba. Along with the export paperwork required for U.S. suppliers, it’s stipulated that Alimport must pay the American exporter. As per OFAC’s guidelines, only a handful of foreign banks are allowed to process such payments into U.S. bank accounts (to be done by letters of credit through third-country banks—usually based in Europe and Canada). Food exporters like Wallesen learned that one reason Cubans must use letters of credit—instead of wire transfers in cash—is concern that Alimport (a Cuban government entity) taking title to goods still sitting at a U.S. port may subject the goods to seizure by Miami Cubans who have legal judgments against the Castro regime. The seized food shipments could be used to help satisfy such civil claims. In addition, OFAC has restrictions on which ports of exit are authorized to handle cargo destined for Cuba. Most are concentrated in the Southeast, and include the ports of Everglades, Jacksonville and Tampa, Florida; Savannah, Georgia; New Orleans, Louisiana; Mobile, Alabama; Gulfport and Pascagoula, Mississippi; and Port Arthur and Corpus Christi, Texas. Would-be exporters are advised to verify other OFAC-authorized ports of exit with their shipping company. Of course, WestStar Food is not the only U.S. supplier of dry beans into Cuba. Others include commodity trader PS International, based in Chapel Hill, North Carolina; St. Hilaire Seed Co., based in St. Hilaire, Minnesota; and another Minnesota entity, Anderson Seed Co. The latter two were bought out earlier this year by Canadian entity Legumex Walker, a specialty grain company based in Winnipeg. In recent years, these and other U.S. dry bean suppliers have had no complaints in trading with Cuba. According to USDA figures, dry bean exports from U.S. suppliers to Cuba reached $7.7 million last year, up from $5.6 million in 2010 and $4.3 million in 2009. But 2006 was perhaps the strongest year for U.S. dry bean sales into Cuba, with record sales totaling $10.9 million. Still, Wallesen worries about Cuban purchases in the near future, because of higher prices for beans and other agricultural goods these days. “The drought in Mexico pushed their purchases up, and (world) prices have gone up,” says Wallesen, knowing that the Cubans are notorious for turning to cheaper, non-U.S. suppliers when the occasion calls for it. Despite such advice, trade figures generated by U.S. food exports to Cuba are still luring U.S. food producers—brokers as well—to visit Havana. As shown by U.S. Department of Commerce statistics, U.S. food export sales to Cuba peaked in 2008 ($710 million) and 2009 ($528.4 million), with 2011 figures standing at $347.2 million. Americans are shipping more than beans to the Forbidden Island. An unlikely success story in America’s revived food trade with the Cubans is Splash Tropical Drinks, a Ft. Lauderdale, Florida-based supplier of daiquiri and margarita drink mixes that had been supplying such goods to tourism hotspots within the U.S. and various countries in the Caribbean and Latin America. Splash’s clientele included Sandals, SuperClubs, Marriott, Sysco Food Service and various all-inclusive resort operations in that region. Splash became one of the first U.S. food companies to sign a deal with Alimport in the early 2000s. Since then, its products have been consumed at Havana’s famed Hotel Nacional, Hotel Meliá Cohiba and other resorts and restaurants on the island. In 2009, Splash’s owner, 43-year-old Brooklyn native Richard Waltzer, mentioned to the South Florida Sun-Sentinel that due to the extra business Cuban sales had generated for his firm—several million dollars annually—he added four staffers to his 50-employee work force. That same year, Waltzer, under his sister firm Procurement Systems Inc. (PSI), expanded efforts to push into Cuba’s robust tourism market. He was even spotted on CNN pitching supermarket-ready products such as Miller Draft beer and Haagen-Dazs ice cream at Havana’s International Trade Fair (FIHAV). Held every November, FIHAV attracts prospective food and consumer-product exporters from all over the world. “This is one of the things people are going to pay premium for, especially the tourists that have the dollars,” Waltzer told a CNN correspondent at FIHAV, referring to the brand name-packaged products recognizable to U.S. and other consumers. It’s no surprise that Waltzer wants to hawk supermarket goods in Cuba’s tourism market. U.S. State Dept. 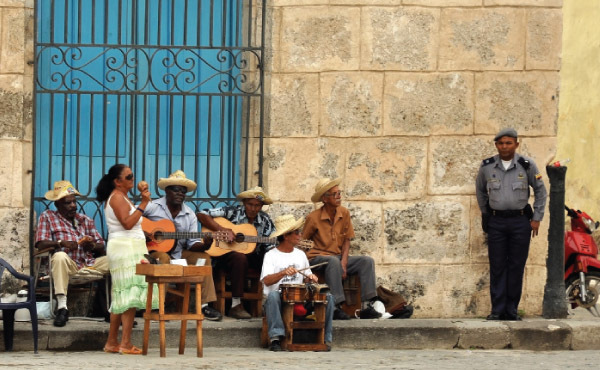 figures confirmed that by 2010, 2.53 million foreigners had visited Cuba (mainly from Canada, Western Europe and elsewhere), with that sector generating $2.4 billion in revenues that year. At a subsequent seminar on U.S. trade with Cuba at Tampa, Florida, Waltzer also mentioned another potential market for well-known brand items like Kellogg’s Corn Flakes and Heinz Ketchup: Cuban-American visitors. “What we want to do is bring American-branded products to supermarkets in Cuba, as many as we can, as soon as we can,” Waltzer said at the time. The market potential for U.S. exporters of such goods is as clear as the island’s famed turquoise-blue waters. The U.S. State Dept. estimates that from $800 million to as much as $1.5 billion a year in remittances are sent to Cubans by their overseas relatives (mainly in America). A sizeable portion of that cash flow ends up in the island’s supermarkets and overall retail sector. “[Supermarket managers in] Cuba had to mark it up 240 percent before selling it in the dollar stores,” says U.S.-Cuba trade advocate Kirby Jones, referring to such packaged items being sold in local supermarkets. Jones should know—his trade consulting firm, Alamar Associates (based in Washington, D.C. until recently), successfully put together trade seminars between Cuban officials, U.S. companies in Cancún, Mexico, and Havana itself, well before the first containers of U.S. farm goods left their ports of exit for Cuba during the early 2000s. Jones also explains how Cuban supermarket managers maximize profits by carrying, for example, an obscure brand of ketchup from Spain, versus carrying the universally known but pricier Heinz brand from Pittsburgh. However, familiar regional U.S. convenience store staples like Wise-brand potato chips (from Canada) and even Colgate brand toothpaste have found their way into Cuba through third-party international traders who strike one-shot deals with the Cubans. Whether Alimport is given the green-light to negotiate deals for such goods direct with U.S. manufacturers still remains to be seen. As one observer notes, “it may take another hurricane to make that happen.” Given how U.S. agricultural trade with Cuba got to where it is now, that can’t be ruled out in the near future. Two thirds of the 176 countries ranked in Transparency International’s index on corruption perceptions scored below 50 this year on a scale from 0 (perceived to be highly corrupt) to 100 (seen as very clean), the non-profit organization said. Denmark, Finland and New Zealand all tied as the least corrupt countries in the world, with 90 points, while Somalia, North Korea and Afghanistan were perceived as the most corrupt with 8 points, the Transparency International Corruption Perceptions Index 2012 showed. “While no country has a perfect score, the majority of countries score below 50, indicating a serious corruption problem,” Huguette Labelle, Transparency International chair, said. By geographical region, Eastern Europe and central Asia was perceived as the most corrupt, with 95% of countries scoring below 50. Georgia – where a drastic reform of police forces which has seen thousands of officers replaced was carried out relatively recently – was ranked as the least corrupt with Turkmenistan and Uzbekistan perceived as the most corrupt. Sub-Saharan Africa was next, with 90% of countries scoring below 50; the least corrupt was Botswana and the most corrupt, Somalia. In the Middle East and North Africa, 78% scored under 50, with Qatar and the United Arab Emirates the least corrupt and Iraq the most.Asia Pacific followed, with 68% of countries scoring below 50. New Zealand was the least corrupt in the region while Afghanistan and North Korea, the most corrupt. It was followed by the Americas, with 66% scoring below 50; Canada was the least corrupt while Haiti and Venezuela, the most. The region that was perceived the least corrupt overall was the European Union and Western Europe, where 23% of the countries scored below 50. The least corrupt countries were Denmark and Finland and the most corrupt was perceived to be Greece, which scored 36, on a par with emerging countries such as Colombia, India, Moldova or Mongolia. If not doing business in Morocco doesn’t immediately register as noteworthy, that’s understandable. You just haven’t met Bob Harris. Over the past 50 years of working the paper and box industry, he’s visited more than 160 countries and still maintains clients in many of them (except Morocco, of course). 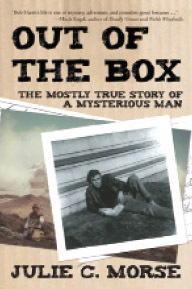 Julie C. Morse’s new biography, Out of the Box: The Mostly True Story of a Mysterious Man, chronicles Harris’ adventures as part travelogue, part business how-to. Asked to distill tips for a young salesman, Harris offers something more akin to philosophy: Go anywhere in the world on your own nickel, build relationships with the No. 1 company distributing your product, and you’ll get your commission. For Harris, this works as well in 2012 as it did in the 1960s. Shares in Yum Brands Inc. YUM -9.92% fell sharply Friday after the fast-food chain said its sales in China have softened and damped earnings expectations for next year. The parent company of Taco Bell, KFC and Pizza Hut said late Thursday it expects fourth-quarter sales at outlets open more than a year to contract 4% in China because of weakness in the world’s No. 2 economy. That compares with same-store sales growth of 6% in the third quarter and 21% in last year’s final period. Zuma Press Yum Brands’ explosive growth in China is cooling, as is the economy. 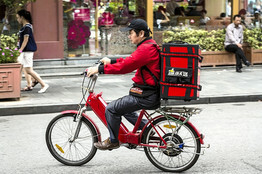 Above, a Pizza Hut delivery in Shanghai. Workers sew medical garments in Ghana at a Lucky 1888 factory, which is competing with Asian suppliers. ACCRA, Ghana—When Isaac Osae began his sewing career last year, he stitched tropical-colored sundresses. These days, the 24-year-old factory worker is learning to sew hospital smocks. Along Africa’s Atlantic coast, garment factories are giving up African couture to assemble scrubs, aprons and lab coats. The switch comes as global suppliers seek out Africa’s low-cost, English-speaking labor and ports that are 10 days closer than Asia’s garment factories are to the U.S. eastern seaboard. “Africa for me, it’s the next zone of apparel,” Mr. Schiffman says. Wal-Mart bought more than a half million hospital scrubs this year from Ghana’s Lucky 1888 Mills Ltd. Liberty & Justice, a sustainable development firm, makes 350,000 pairs of trousers a month in Ghana for U.S. buyers. In nearby Liberia, Liberty & Justice makes tote bags for New York’s Godiva Chocolatier Inc. 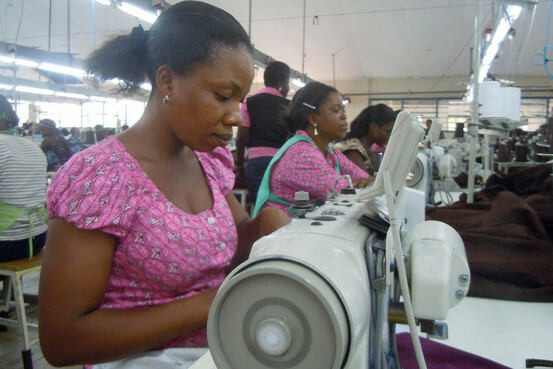 But the garment business is a capricious industry that has swept in and out of Africa before. Casualwear factories sprang up in East Africa in 2000 and tripled production in five years, after the U.S. Congress passed the African Growth and Opportunity Act. The law lets democratic countries on the continent ship to the U.S. duty-free. But even with that advantage, East Africa’s workrooms have struggled to win the massive orders that China’s factories have. The law expires in 2015, and African textile tycoons say they will be forced to halt production if it isn’t extended. West Africa, meanwhile, isn’t on the global garment trade’s map. Decades of military dictatorship in almost every country in the region scared off investment. The economy of Ghana, an English-speaking nation released from British rule in 1957, flatlined during 35 years of off-and-on dictatorship. In 2005 Ghana produced half the amount of clothing it did in 1977, the government says. 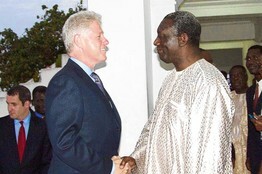 Former Ghana President John Kufuor welcomed former U.S. President Bill Clinton in Accra, Ghana in 2002. But Ghana now is a stable democracy with one of the world’s fastest-growing economies. That has brightened prospects for companies such as Dignity Industries. Last month, a walmart.com supplier expressed interest in placing orders from Dignity, where Mr. Osae grapples with his sewing machine. First, though, the crew of self-taught needle workers must master mass production. A Filipino sewing instructor, hired by Dignity, taps the poorly stitched collar of a hospital gown. “You start again,” she advises Mr. Osae. Asian and Latin American dressmakers tend to sew faster. “Much faster,” says Sandra Garcia, a Honduran sewing coach at Lucky 1888. If factories here want Ghana to compete with the world’s biggest garment makers, they will have to assemble a medical scrub in eight minutes. Tailors like Mr. Osae are paid $100 a month, a third of what seamstresses in some parts of China might expect, according to the World Bank. Still, Africa’s clothing mills are burdened with power outages that send machines spinning to a stop. Dignity’s owner, Salma Salifu, opened shop in the 1990s with ambitions to export Ghana’s high-fashion clothing to U.S. showrooms. At Dignity’s peak, each year it shipped hundreds of colorful garments, termed afrocentrics by designers, during Black History Month, at up to $300 a dress. Former U.S. President Bill Clinton stopped by for a visit in 2002. But stateside interest in afrocentrics appears to be waning. Many of the factories President Clinton toured have been boarded up. African-fashion boutiques in Philadelphia and Washington that have filed for bankruptcy owe Mrs. Salifu $36,000, she says. In October, Mrs. Salifu mailed her first prototype to a walmart.com supplier. She hopes to sell hospital smocks at $1 above her cost for fabric and thread, netting a two-cent profit. Factory owners nearby are competing for the same business. Since last year, Lucky 1888 has shipped four containers of scrubs a month to a Wal-Mart supplier from a once-idle factory near the port outside Accra. Jonathan Simon, chief executive of the U.S.-Pakistani company, plans to triple production by 2015, install a fabric-weaving plant and truck in cotton from nearby Burkina Faso. He intends to add 2,000 workers to his factory floor, where Janet Azure works a sewing machine. Ms. Azure, 25, used to run her own workshop, stitching what designers here call slit and kaba: two-piece, traditional church dresses. She now makes $10 more a month sewing hospital smocks. “The money is here,” she says.